Dreambuilder 23, a 1980s kitchen renovation, is complete! Kara Anderson loved her home — but hated her kitchen! Built in the 1980s, the kitchen was large and in good condition — but was closed off from the rest of house and showing its age stylistically. 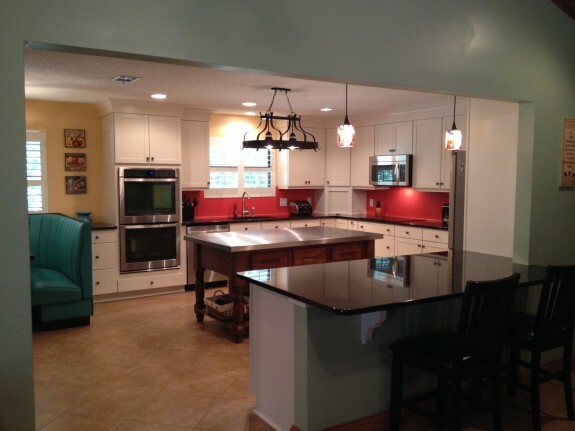 Kara called Dreambuilder in to help her transform her outdated kitchen into a contemporary showplace — and Dreambuilder 23 was born. The primary requirement for the project was the removal of the wall between the kitchen and great room, opening up the space. A new counter-height bar was added for additional seating. And now, with wide-open views between rooms, cooking and entertaining can easily take place. 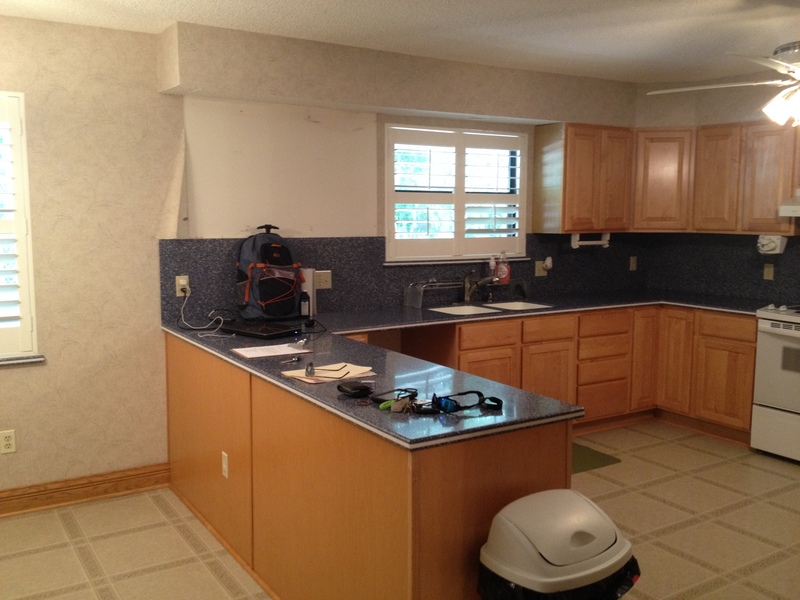 Old oak cabinets with blue countertops were replaced with antique white painted cabinets and granite countertops. By removing the soffit over the old cabinets, 42″ tall upper cabinets were used instead of 30″, increasing storage capacity. The centerpiece of the new kitchen is the owner’s beautiful wood island with stainless steel top. Over in the breakfast area, the diner-feel was emphasized with a reclaimed restaurant booth. The bright colors of the booth were complemented with the Honey Blush wall color and the Gladiola backsplash color, courtesy of Sherwin-Williams paints. These colors are also reflected in the stained glass light fixtures over the booth and the bar. This created exactly the kind of kitchen Kara was hoping for: a diner feel, colorful and happy, and open to the great room. New stainless steel appliances and tile flooring finished out the renovation project. 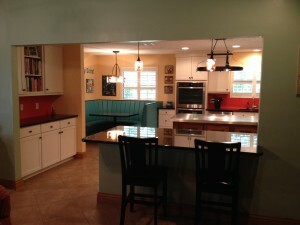 You can see more pictures of this project in our Dream Home Gallery. If you’re ready for your own kitchen transformation, contact us today for a complementary consultation.